This text-based adventure wants to force you into its linear story, but allows you to explore beyond delivering "the artifact." There appears to be no leveling cap, which means you can turn a character into an absolute monster in a great way. The main story is incredibly linear: deliver "the artifact" from town 1, through town 2 into a castle, etc. Following only the story would make for an incredibly short game - play the side quests. I was incredibly impressed by the game as a whole. There was never a time where I felt like I was fighting against the game to accomplish a task, which is very important. I was drawn into the game and played it for quite some time. The battle system of the game is where the majority of your time will be spent, but it is for good reason. The developers of the game clearly knew their strong points and pushed that as much as possible. I would highly recommend this game to anyone, no matter age or skill; it's just a blast to play. Your adventure begins with a small group of people who are travelling together and manage to find a crystal of sorts. After investigation, it is found to be "the artifact." The storyline is driven by attempting to deliver the artifact to someone else, even though the magician of the party seems to want to keep it for himself and let chaos ensue. What happens if you do not deliver the artifact to the necessary parties? What if the mage wants to keep it for himself and rule the world with an iron fist? Who knows, because those events are not possible because of the incredibly linear story line. After visiting town one, you move on to town number two, until you eventually travel to a castle. If you were to only follow the main quest line, I feel like the game would end a bit to quickly and you would miss out on all of the fun adventures of raiding innocent merchants and being robbed by lone thieves. Although the linear plot line, the raiding of "innocent" travelers should have caught your attention enough to want to deviate from the main path. After each mission you have three options that you can choose from, each of which will launch a different event. The first being the main story line, which ultimately is your main goal, and continues the adventure. The next event available is the side quest, which allows you to go fight things in random locations. Sometimes the event will have you protect a farm, while other times you will travel to the sewers to beat up giant rats. Overall, the side quests are exactly the same, where you fight stuff but sometimes with different reasons. The interesting part of the story is when you trigger a quick event. The event is just a question in which you pick one answer or the other, but they actually influence the game. You can choose to help a wandering merchant from a pack of goblins, or you can steal his stuff and run. You get robbed by a thief, you can give up the items in your inventory or lose health. Whatever you choose, the decision is not game breaking, but fun and advances the characters forward. The beauty of the game does not come from its complex systems, but rather its simplistic ones. The game starts off with a few simple tutorials, and within five minutes you know how to play the entire game. There are quite a few icons during the level up process, and if for any reason you forget, you can simply hover your mouse over them and see what it stands for. There are few games that can be picked up so easily and enjoyable at the same time. The place where you spend most of your time is in the battle scene. This is where the most complex features of the game exist, but luckily they are quite easy to master. Each time a rotation of monsters occurs, a new item appears in your inventory. You are only able to hold five items at a time, so if your inventory is full, the last item will be discarded. If an item is currently better than the one equipped to the character that you have selected, then a green up arrow will appear on the item; a downwards red arrow will appear if it is worse. The equipable items are a weapon and a shield, and the higher the number on the item, the better it is. Occasionally a potion or level up scroll will appear in your inventory, and you can apply it to a character. Throughout my entire play through I managed to only lose one character to the pointy end of a sword. My mage, now a strange looking puddle thing, has paid the ultimate price for his adventure. Like any sane person I began to make arrangements for his family, but then I saw a little icon above his puddle that appeared to be a potion. At this point I was desperate; no one wants to confront the family of a dead mage, so I poured one of my health potions on him. Not only did he rise from the grave, but he came back with half health, which was quickly solved by a second health potion. Now that my party was in good standing, it was time to start taking down some monsters. There is the normal attack every few seconds, but the fun happens when you use a character's skills. 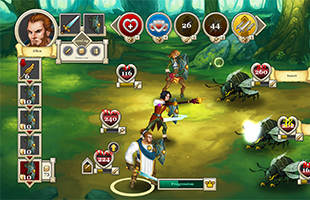 Each character can hold a maximum of five skills, each of which have quite a long recharge time. The mage has mostly damage things, such as a fireball that hits all of the enemies for silly amounts of damage. The assassin character had my favorite skills, which was instant death for any monster it hits. At the beginning of fights I just hit the instant death button, and watched her relax. The paladin character had a bit more trouble handling his enemies though, because he didn't really have damage spells. His kit was focused around giving the party health, damage and armor. Although the paladin was always the last to kill his monster, he was by far my most important with his team buffs. It didn't help that he could swing and miss the broad side of a barn door, but that just gave him more time to recharge his heal and buffs for his teammates. I managed to play for a little over four hours, and now my characters are in tip top shape. Everyone's armor and weapons are high level, and I understand the recharge times of all of the skills to use them to their maximum efficiency. My mage was the first character to do it, but he reached level 100. I assumed that I am starting to have plenty of damage, so this must be the level cap; sorry Mr. Mage, but your reign of death and destruction must come to a halt. Oh boy was I mistaken. Ding! Mage man hits level 101, thus putting an end to my silly theories. The characters continued to climb in levels, and I never really saw a level cap. The monsters appeared to become stronger as my characters leveled up, but they couldn't keep up. I started to get to a point where my characters would barely lose health. Everything that I wanted to click on was easy to understand and did exactly what I expected it to. The user interface for a game is very important because it is what brings a player into believing that they are really controlling what is happening. The game was great at removing the barrier of "I don't know what to do next" to "all right let's move on to the next mission and beat up some things." The tutorial was crisp, clean and to the point, which really helped with getting the player into the game and onto the next battle. By no means were there realistic, high definition cinematic scenes, but the graphics were overall pretty solid. Everything looked to fit in the theme and was easily identifiable, which was the most important for me. The characters did not move very much overall due to the text based storyline in which you are given a picture of a character with some text on it, clicking the screen advances the conversation. The game however would feel a little out of place with a fancy and complex graphics system that allowed for a wide array of actions. As I said before, the beauty of the game came from its simplicity. The soundtrack for the game was fine, nothing great. This kind of pairs up with the graphics in a big way, because the graphics were simplistic with little unexpected actions. There were not really any events that called for dramatic music to suddenly take over because the story was driven by the click of a mouse; nothing was controlled by a timer to allow for a sudden change in musical tone. This however does not mean that the music is poor; actually quite far from it. The beat kept me in rhythm with my characters during battle and allowed me to sync up with everything that happened in the game. I felt like the level-up system needed a little attention because of how important it is to the game, but also how incredibly subtle it is. Leveling up is quite literally the process of click one of three circles above your character's head. Each time a character levels up, the three available options are different, but it always comes in the same exact format of select one, two or three. There were a few times in which I forgot what the icons stood for, but I just placed my mouse over the icon and half a second later it would tell me exact what it is. About an hour into the game, I could level up a character without thinking about it. I think one of the great options of the level up system is that there are usually two options that increase a characters damage or health, but there is usually one that increases things like event chance. It is easy to select damage every time you level up, which is exactly what I did with my assassin and she became a monster, but there is a certain pleasure in selecting more events. The game is 90% battling, but I feel like the 10% events are from leveling up my party to be more likely to find events.